Peter Bergen is a print and television journalist, documentary producer, think tank executive, professor, and the author of five books, three of which were New York Times bestsellers and four of which were named among the non-fiction books of the year by the Washington Post. The books have been translated into twenty-one languages and have been turned into four documentaries, two of which were nominated for Emmys and one of which won an Emmy. He is Vice President for Global Studies and Fellows and the Director of the International Security Program and the Future of War program at New America in Washington D.C.; Professor of Practice at the School of Politics and Global Studies at Arizona State University where he is the co-director of the Center on the Future of War; CNN’s national security analyst and a fellow at Fordham University’s Center on National Security. Bergen is on the editorial board of Studies in Conflict & Terrorism, a leading scholarly journal in the field, and has testified before multiple congressional committees about Afghanistan, Pakistan, ISIS, al-Qaeda, drones and other national security issues. He is a member of the Aspen Homeland Security Group and a contributing editor at Foreign Policy and writes a weekly column for CNN.com. Bergen is the chairman of the board of the Global Special Operations Foundation, which is a non-profit advocating for the interests of special operations forces. He is also on the board of the James W. Foley Legacy Foundation, which advocates for Americans who are being held hostage and for journalists in conflict zones. He has held teaching positions at the Kennedy School of Government at Harvard University and at the School of Advanced International Studies at Johns Hopkins University. 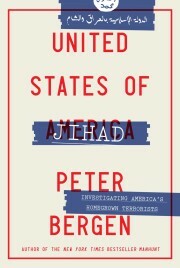 Bergen’s most recent book, United States of Jihad: Investigating America’s Homegrown Terrorists, was published in 2016. Director Greg Barker adapted the book for the HBO film Homegrown: The Counter-Terror Dilemma. His previous book, a 2012 New York Times bestseller, was Manhunt: The Ten Year Search for Bin Laden, from 9/11 to Abbottabad. The book was translated into nine languages and HBO produced a documentary based upon it. The film, for which Bergen was the executive producer, was in the Sundance Film 2013 competition and it won the Emmy for best documentary in 2013. The Washington Post, named Manhunt one of the best non-fiction books of 2012 and The Guardian named it one of the key books on Islamist extremism. The Sunday Times (UK) named it the best current affairs book of 2012 and The Times (UK) named it one of the best non-fiction books of 2012. The book was awarded the Overseas Press Club Cornelius Ryan award for best non-fiction book of 2012 on international affairs. Bergen was awarded the Stephen Ambrose History Award in 2014. His 2011 New York Times bestseller, was The Longest War: The Enduring Conflict between America and Al-Qaeda. New York Times book reviewer Michiko Kakutani writes, “For readers interested in a highly informed, wide-angled, single-volume briefing on the war on terror so far, “The Longest War” is clearly that essential book.” Tom Ricks also writing in the Times described the book as “stunning.” Longest War won the $30,000 Gold Prize for best book on the Middle East of 2011 from the Washington Institute. Newsweek and the Guardian named Longest War as one of the key books about terrorism of the past decade. And Amazon, Kirkus, and Foreign Policy named Longest War as one of the best books of 2011. His previous book was “The Osama bin Laden I Know: An Oral History of al Qaeda’s Leader” (Free Press, 2006). It was named one of the best non-fiction books of 2006 by The Washington Post. “The Osama bin Laden I Know” was translated into French, Spanish and Polish, and CNN produced a two-hour documentary, “In the Footsteps of bin Laden,” based on the book. Bergen was one of the producers of the CNN documentary, which was named the best documentary of 2006 by the Society of Professional Journalists and was nominated for an Emmy. Bergen is also the author of Holy War, Inc.: Inside the Secret World of Bin Laden. (Free Press, 2001). Holy War, Inc. was a New York Times bestseller, has been translated into eighteen languages and was named one of the best non-fiction books of 2001 by The Washington Post. A documentary based on Holy War, Inc., which aired on National Geographic Television, was nominated for an Emmy in 2002. Bergen was the recipient of the 2000 Leonard Silk Journalism Fellowship and was the Pew Journalist in Residence at the School of Advanced International Studies at Johns Hopkins University in 2001 while writing Holy War, Inc.
Talibanistan: Negotiating the Borders Between Terror, Politics, and Religion is a collection of essays about the Taliban that Bergen edited with Katherine Tiedemann that was published by Oxford University Press in 2013. The New York Review of Books described the book as “a frequently brilliant collection of essays by different experts on the Taliban in Afghanistan and Pakistan.” Cambridge University Press published Drone Wars: Transforming Conflict, Law, and Policy in 2014 which Bergen edited with Daniel Rothenberg, in which a variety of experts consider how armed drones are reshaping warfare and the legal norms that surround it. Together with his wife Tresha Mabile he produced “American War Generals” a film for National Geographic Television that aired in 2014. They also produced “Legion of Brothers” for CNN Films, which was in the 2017 Sundance Film Festival and was released theatrically in the summer of 2017. The film was nominated for an Emmy for best Political/Government documentary in 2018. He was a contributing editor at The New Republic for many years where he wrote several cover stories and he was the editor of the South Asia Channel and the South Asia Daily, online publications of Foreign Policy magazine from 2009 to 2016. He was a fellow at New York University’s Center on Law & Security between 2003 and 2011. Bergen has written about al-Qaeda, Afghanistan, Pakistan, counterterrorism, homeland security, ISIS and countries around the Middle East for a range of American newspapers and magazines including the New York Times, Los Angeles Times, Foreign Affairs, The Washington Post, Wall Street Journal, The Atlantic, Rolling Stone, TIME, The Nation, The National Interest, Mother Jones, Newsweek, Washington Times and Vanity Fair. His story on extraordinary rendition for Mother Jones was part of a package of stories nominated for a 2008 National Magazine Award. He has also written for newspapers and magazines around the world such as The Guardian, The Times, The Daily Telegraph, International Herald Tribune, Prospect, El Mundo, La Repubblica, The National, Der Spiegel, Die Welt and Focus. And he has worked as a correspondent or producer for multiple documentaries that have aired on National Geographic, Discovery and CNN. The AfPak Channel for which Bergen was the editor was nominated in 2011 for a National Magazine Award for Best Online Department. In 1997, as a producer for CNN, Bergen produced bin Laden’s first television interview, in which he declared war against the United States for the first time to a Western audience. In 1994 he won the Overseas Press Club Edward R. Murrow award for best foreign affairs documentary for the CNN program “Kingdom of Cocaine,” which was also nominated for an Emmy. Bergen co-produced the CNN documentary Terror Nation which traced the links between Afghanistan and the bombers who attacked the World Trade Center for the first time in 1993. The documentary, which was shot in Afghanistan during the civil war there and aired in 1994, concluded that the country would be the source of additional anti-Western terrorism. From 1998 to 1999 Bergen worked as a correspondent-producer for CNN. He was program editor for “CNN Impact,” a co-production of CNN and TIME, from 1997 to 1998. Previously he worked for CNN as a producer on a wide variety of international and U.S. national stories. From 1985 to 1990 he worked for ABC News in New York. In 1983 he traveled to Pakistan for the first time with two friends to make a documentary about the Afghan refugees fleeing the Soviet invasion of their country. The subsequent documentary, Refugees of Faith, was shown on Channel 4 (UK). Bergen has a degree in Modern History from New College, Oxford University. He won an Open Scholarship when he went up to New College in 1981. Before that he attended Ampleforth. He was born in Minneapolis in 1962 and was raised in London. He is married to the documentary director/producer Tresha Mabile. Her website can be found here http://www.treshamabile.com. They have a son and a daughter.